"I grew up around Philippine families, and learned how to make adobo. I've since 'Americanized' the recipe, and customized it to suit my family's tastes. It's a meltingly tender, sharp-flavored stew that can be made with pork or chicken. Best served over rice. (For a thicker sauce, be sure to blend flour with liquid before adding to sauce to prevent lumps from forming.)" Heat the oil in a Dutch oven over medium heat, and cook the pork until evenly browned. Mix the garlic into the Dutch oven, and cook 1 minute, until tender. Pour in the chicken broth, soy sauce, and cider vinegar. Place the bay leaves into the mixture. Bring to a boil. 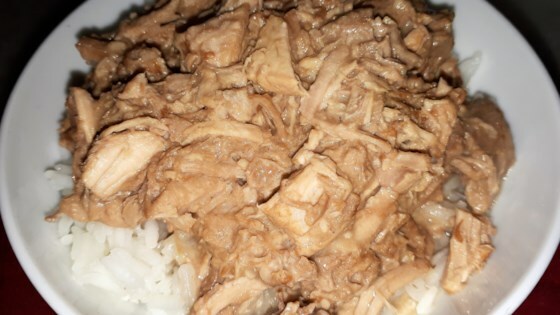 Reduce heat to medium low, and cook 1 hour, or until the pork is easily shredded with a fork. (For a thicker consistency, blend a small amount of flour with coconut milk, chicken broth, or water, then stir into sauce.) Make sure the meat stays moist and covered with the liquid. If meat looks like it's drying out, add a bit more chicken broth or water. Stir flour into coconut milk and add to the Dutch oven. Continue cooking until heated through. Try your hand at flavorful Filipino food! Good recipe, not as sour as I remember it being and I wish the sauce was thicker but my daughter loved it!